Mrs Gnomepants V1.0 is the keeper of this album of which I have a digital rip. Weirdly, and possibly because of you know “internet downloading”, I appear to have a fusion of two versions of this album: the original 1998 CD rip and the 2003 Special Edition. Of the two versions, it’s the original I prefer, I’m not sure why producers think remixing things is something people want to hear. I mean imagine someone going into the Louvre and remixing the Mona Lisa the making the remix the only version people could see. There would be uproar! Impossible Princess is a marked divergence from Minogue’s usual pop princess style and, I think at least, is her best work. She has said of the album that she would never do another like it and it is her least favourite. Also, sadly, exposure wise, it didn’t fair as well as other albums, especially in the UK, as its release coincided with the death of Princess Diana, so was renamed Kylie Minogue and release was delayed until the buzz had died down. This and Air’s Moon Safari are two albums that define a period where there were a lot of changes in my life every time I hear songs from it, fond memories are invoked of people I’ve not seen in ages and events and activities partook. It still, even nearly 20 years since its release and about ten years since I last listened to it, sounds amazing. Trying to cash in on the popularity of grumpy skater chick Avril Lavigne, music execs yoink another young lady with attitude into the limelight. That lady was Michelle Branch. I remember how the American music execs positioned itself to launch Branch to the European side of the pond. This previously unheard of artist started to appear on late-night European chat shows and a couple of her songs popped up here and there as incidental music on TV shows. Even the Guardian newspaper’s Saturday supplement suggested that no middle-class proto-hipster’s coffee table would be complete without a carefully placed copy of the album to wow their less cultured dinner party guests. I bought it. I liked it. I listened to it in conjunction with the more feisty Lavigne. I watched as almost like a light switch being turned off, Branch seemed to dissolve into the general white noise of music, overshadowed by Lavigne and later, more successful artists. When we last saw Broadcast, they were working with Focus Group Investigating Witch Cults in the Radio Age, a hauntological psychedelic album with a tragic epitaph. Ha Ha Sound is Broadcast’s second studio album. This traditionally “difficult” second album demonstrates the further development of Broadcast’s musical talent. Indeed, while lacking the finesse (and additional production from Focus Group) having heard the later Witch Cults first I was reluctant to spoil my impression of Broadcast by polluting it with earlier works. But in this instance I was rather surprised by how much I like it. Think Portishead only 30 years ago. Camp dance punk from Detroit’s Electric Six. This actually grew on me. I was aware of Danger! High Voltage and Gay Bar thanks to Joel Veitch’s early flash animations on B3ta and my ex-wife’s love of things camp. But I had resisted the band and the album for several years until I accidentally gave the album a full listen in about 2010 while my MP3 player was on repeat. At the time I was concentrating on a game of World of Warcraft so didn’t realise that the album had repeated itself about 4 times, so it wasn’t as bad as I first thought. Since then its tracks have appeared on many random shuffles without skippage and sometimes….I do wiggle my bum in a little dance. As regular readers will know, my music collection is comprised of CDs and MP3s inherited over 30 years of relationships as well as those I’ve obtained nefariously and legitimately. Today’s album falls into the inherited bracket. I’ve never been much of a follower of what some people call mainstream music. Bands like Oasis, Blur and Pulp passed me by in the nineties and likewise, bands like Coldplay and Snow Patrol feature on my life’s soundtrack purely as “music that’s on the radio too much”. Such music often becomes illustrative or indicative of the period or era of our lives. For example Duran Duran, Visage and Human League will forever be synonymous with being in primary school in the eighties for me, Deacon Blue takes me to being a teenager at secondary school and Simple Minds will always transport me to my first stint at University. Listening to Snow Patrol’s album Final Straw I was immediately transported to the noughties at a time of my life when I was in my thirties living in Liverpool. However, I’m not, as I often say, a fan. Over saturation of airplay frequently is frequently a cause of this and I often feel cheated or left out when, years later I revisit songs and bands with a more mature outlook. Much like how I feel about Elbow and Reef. Final Straw is Snow Patrol’s third album and was released in 2003. Award winning and, as previously described, overplayed, I inherited the rip of this album from Gay Jamie along with a whole brace of other albums. Often with the music project I come across albums I wasn’t even aware I had. As is the case with Fallen, I often find that I’ve not listened to the albums before either. Sadly I’m at an age where listening to music on a regular basis is no longer necessarily a possibility. Life styles change as we age and we swap dark clothes and music for peaceful evenings in tweed. Then listening to things that probably would have had your younger self bouncing up and down or wearing out the belt on the turntable now seems like an effort and the content seems trite and an inconsequential and unnecessary re-egging of old pudding. As we already know from Fields Of the Nephilim‘s previous gracing of the music project, I was quite keen on the band in my younger days with a resurgence during the darker days of midlife crisis. I keep remembering that Carl McCoy is about the same age as my older brother and then I’m often amused by the mental imagery of my older brother growling along to rock songs trying to look dark, sinister, forsaken and undead. And looking like someone’s dad at a bad karaoke. And that is what Fallen is like. Fallen is FON’s 2003 resurgence album featuring Carl and a whole new bunch of mates. Popular in Europe, popular amongst fan’s thirsty for more after an eleven year hiatus but I found it kind of like a shabby chic kitchen table. Firm, well put together but a shade of its former self. With a chalky coat of paint. I believe that the popularity of Evanescence can be linked to American music execs attempting to capture the zeitgeist of female fronted goth rock bands and the increasing popularity of big breasted valkyrien symphonic goth metal from Scandinavia. Their popularity was fuelled by their appearance on a variety of slightly emo-esque movies of the time such as Daredevil only to wane and disperse following rumours of Christian rock leanings. Initially I was just as keen as most other people. I liked the sorrowful My Immortal and I started to admire their most popular Bring Me to Life until analysing the lyrics had me realise that there was something fishy in the belly of this whale and that there was possibly a leaning towards the insidious proliferation of religion in youth culture by conservatives keen on dulling the growth of the darker shades of popular culture in the shadow of Columbine and the implication of such culture in inspiring those involved in the shootings, with the additional moral panic whipped up by the American hyper-conservative based Murdochian press towards goths. The album Fallen is the bands first album (We’ve already seen their second album, Anywhere But Home, on the music project) and serious fans might suggest their only album (the band split and changed its line up before their third album). It’s presence in my music collection solely because I was fond of two tracks at a time when I should have known better. 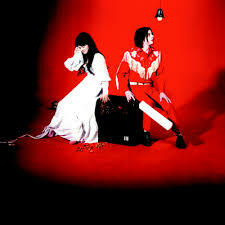 Like most albums, this album is a snapshot of a time for me. If I think of it I remember that it is one of the last albums I had in a particular format – cassette. Naturally I didn’t actually buy it on cassette. No, my best friend taped it for me (remember: home taping is killing music) and I listened to it on my Sony Walkman walking to and from work, tramping along in time to Seven Nation Army. Fun fact kids: It is actually my second favourite ‘get-somewhere-quickly-when-walking’ song, my favourite being Sheriff Fatman by Carter USM. Once I upgraded to my iPod I had just that one song left and I never listened to the album any more. Such is life. The problem with downloading music illegally is you are at the mercy of the person who uploads it in the first place. Moreover, you are also at risk of downloading something that isn’t what it says it is, facing the grim potential that the music you have just obtained has been tagged incorrectly. And that is what happened to me when I came across Eclipse. Back in the day, when the internet was young and free, the internet was a lot less commercial. People who had an interest in things would upload unfounded facts and files or post tiled pictures of dancing hamsters to self hosted pages without the desire or need to have it create fame or fortune. And so, at some point, a misguided person uploaded a compilation of Love is Colder Than Death tracks retagged as a long lost Dead Can Dance album. Of course, with only the fledgling Wikipedia to hand and still a great deal of poor information on important matters like “Who did perform this track” available, I was hoodwinked into thinking that it was a complete change in direction for Dead Can Dance. It wasn’t even Dead Can Dance. Eventually though, I managed to work out what the songs were by using a combination of lyric searches and Musicbrainz Picard, and this is the album that 70% of the songs came from. 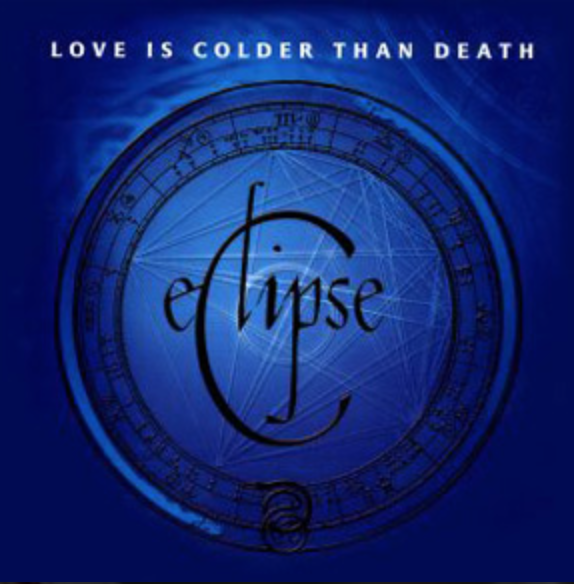 Unfortunately, the isn’t much out on the internet about Love is Colder Than Death. They’re from Germany, they have a website [http://www.lictd.com], they have seven albums and they’ve been going since the nineties. Which might sound contradictory, but in the UK it has always been difficult to access European originating non-mainstream art be it film, television, music or the like despite the Television Sans Frontiers or the Audiovisual Media Services directives, which is a shame because mainland Europe is a vast treasure trove of great stuff, though access to it is getting better. As well as this, lyrically, they’re still a bit sparse on the internet in that their lyrics are difficult to come by, which is a problem because they’re often difficult to decipher or make out. For example, on the song Ideals and Pains I still have no clue what it is he’s singing about. It’s the accent I suppose. 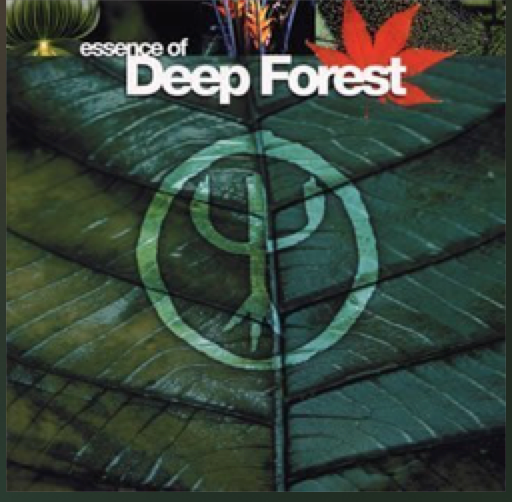 Anyway, it’s easy to see why someone might confuse the band for Dead Can Dance sans Lisa Gerrard and Brendan Perry. Stylistically, this album is very similar to DCD’s Into the Labyrinth and it does feel like a natural progression. Unfortunately, because of the difficulties in obtaining preview copies (to see if I like their other stuff) and unwillingness to part with money in these cash strapped times just to find out I don’t like an album, this is the second of the only three LICTD albums I have and it is unlikely that I’ll dabble with any of their other albums. Especially with the likes of the Aural Apocalypse being off air these days…. Take some Godspeed! You Black Emperor, stir in a bit of Mono (Japan) and top off with a teeny grating of Mike Oldfield, you have Explosions in the Sky. I arrived late at the Explosions in the Sky party and didn’t really progress beyond this album. I like it though and have had it playing while I’ve been flying around the galaxy in Elite: Dangerous. Some time ago I was working in a help desk for a major university in the UK. It was at a time when software and media piracy was looked upon with the same fondness one might have for free toys in boxes of cereal. With that attitude and super fast internet, some of the computers in the main help desk became literal media suckers by day, downloading all manner of treats. Often partial downloads would be left in folders on the computers on the main desk. These folders would be digital gold mines of interesting music and films. One day I found a folder containing several music files. Some of the files were of the Ditty Bops, others were the Decemberists but the ones that struck a chord for me were those featuring the Dresden Dolls. 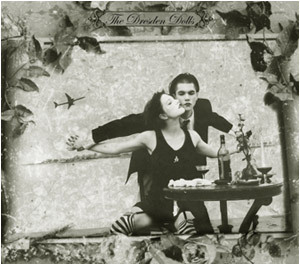 Now we’ve met the Dresden Dolls on the music project before but in their constituent parts; Brian Viglione (who also played with Rasputina, Black Tape For a Blue Girl and Revue Noir) and Amanda Palmer. This is their first album. The one they released before everyone went Amanda Palmer cray-cray and reimagined themselves as hipsters. Two albums here. Well, two versions of an album with the same name by the same artist. Imagine, if you will, you are a girl. Imagine going to an all girls school. Now stop imagining hockey sticks being jolly and sneaking around the dormitory trying to outwit the headmistress and think more about being in a school choir. School choirs are fun, I was in three when I was younger, but what makes them so much more fun is having a great choir master who chooses some good material for you to sing. When I was at school it was more Schubert’s Masses, Faure’s Requiem and Belshazzar’s Feast but these days a more secular approach is taken with popular music being the choice. 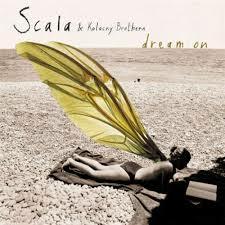 I like to think that whatever school the girls in Scala went to was forward thinking enough to employ the Kolancy Brothers as their music teachers and that the Kolancy Brothers are cool dudes with a broad taste in popular music. Yes, this is a women’s choir from Belgium singing pop songs. Not just ordinary pop songs, pop songs with attitude. RHCP’s Under the Bridge, Depeche Mode‘s Dream On, even Rammstein‘s Engel are given the Scala treatment; kind of the school choir version of Gregorian. Of course, such material is the stuff of proud new-age grandparents and not that of young people, like me, trying to up their street cred. But such material is popular enough to have had several releases as well as several follow up albums. 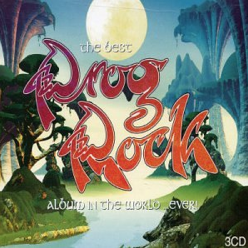 Dream On in the music project appears as two albums, the official extended 2010 rerelease and the unofficial preview release from 2004 which has mostly the same music on but also some sneaky bootlegs and a couple of reinterpretations of material from their other release On the Rocks. This is one of the last CDs I bought. A wicked compilation showcasing a massive range of prog bands covering Canterbury scene, Zappa and even the first sprouts of New Romanticism.